Grilled tuna steaks are a summertime supper favorite; however, grilling is only one way of cooking this versatile fish. You can also poach or pan-sear your tuna on the stove. Leftovers -- if you have any -- make a gourmet tuna fish salad when combined with low-fat mayonnaise or a simple lemon and oil dressing. 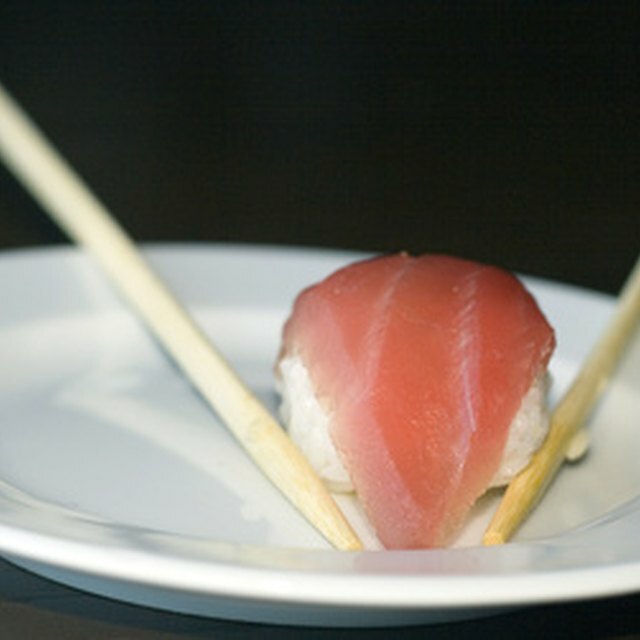 Chefs often cook the tuna so the center is still rosy red rather than opaque and flaky. FoodSafety.gov, the federal government’s gateway to food safety information, recommends that the internal temperature of tuna -- and other fish -- reaches 145 degrees Fahrenheit. Bring the tuna to room temperature by removing it from the refrigerator about 30 to 60 minutes before cooking. Doing so prevents the cold fish from lowering the temperature of the cooking liquid as much. Rinse and pat dry. Keep the tuna covered. Fill the pan with a liquid such as wine, fish stock, water or vegetable broth until the tuna steak is just submerged. Add in seasonings such as lemon or lime slices, peppercorns, celery leaves or sprigs of dill, to taste. Tuna can stand up to strong flavors, so add red pepper flakes, serrano peppers, jalapeno peppers or curry powder, if you wish. Bring the liquid up to a boil. Turn down the heat and let it simmer for 5 minutes to blend all the flavors. Slide in the tuna steak. Turn up the heat until the liquid barely boils, then turn it down to a simmer. Simmer for 10 minutes per every inch of fish. For example, if the tuna is 1-1/2 inches thick, simmer for 15 minutes. Coat the tuna lightly with oil. Press your choice of seasonings such as ground black pepper, lemon zest, garlic or onion powder -- or even commercially prepared spice mixes -- onto both sides of the tuna. Other options include ground nuts, lime zest and mustard. Pour barely enough peanut, canola or sunflower oil in the pan to cover the bottom. Use a paper towel to coat the entire bottom of the pan. Put the pan on a medium-high burner. The oil should shimmer but not smoke. Place the tuna steak in the pan. Turn after 2 to 3 minutes. The bottom should be a rich brown. Lower the heat to medium and turn over the tuna steak. Cook another 2 to 3 minutes. Remove the tuna and place on a platter. A classic Provencal method is to use olive oil as the poaching liquid and simmer the tuna at 225 F for 25 minutes to 40 minutes. If the oil is smoking when pan-searing tour tuna, dump it out and start over. The oil will transfer a burnt taste to the tuna.